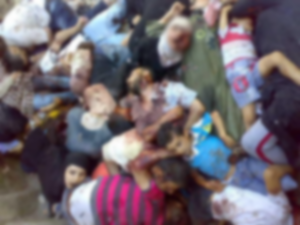 "The Baniyas massacre" apparently occurred on May 3 and 4, 2013, with a few additional killing on May 6, in the coastal city of Baniyas/Banias in Syria's Tartous province. This massacre is closely related to and somewhat confused (especially here!) with the previous day’s Al-Bayda Massacre just south of there. Initial death tolls claimed at least 70 civilians killed but possibly hundreds, and the SOHR eventually settled on "145 civilians (34 children, 40 women, 71 men) killed in the Banias massacre." The Local Coordination Committees on May 9 published a list of 173 claimed victims. Such a death toll would put it in the upper ranks of Syrian massacres for sheer numbers. Other counts give much higher numbers (like 400 total dead, implicitly all civilians ). Lower numbers are also possible. There were many children and women included, with some specific families chosen for massive loss. The massacre of Ras al-Nabi' was also above the average for sheer brutality. There are horrible photos and videos proving extremely violent deaths by men, women, and numerous children, reportedly as young as two weeks old. At least 50 clearly civilian victims, approximately, are visually verifiable by these images (more useful count forthcoming). Beheadings are rare to non-existent here, but there are some sliced throats, and hacked open faces and heads are more common than usual here. Plenty seem to have died from simple gunshot as well, and some deaths by burning -as with the baby charred from the waist down - seems likely in a few cases. Someone wanted to upset people here. Rebels and opposition activists took all those photos, at crime scenes that they could access - sometimes repeatedly over the span of two days - with no problem (suggesting the killings happened in areas under their control). Besides the uncertain death toll, it shouldn't be taken as gospel that these killing even happened just where or when opposition sources say. But as reported, the killing roughly coincided with a brief military assault the government acknowledges, to cleanse Ras al-Nabea of "terrorists." However, rebels and their videos of corpses suggest a more drawn out operation, perhaps in space as well as time, and perhaps coinciding with the rebel retreat from Baniyas. Opposition activist death tolls show deaths continuing into May 4, 5, and 6. It's clearly worth an attempt at sorting out, as usual, on the discussion page. That started out in general discussing both this and the al-Bayda massacre, and never came together fully. Therefore, there's less of anything to even plug in up front. The women and children victims, 26 of them that can be verified with video, were by that video killed in the dark early hours of May 2, when it seems rebels enjoyed military superiority - hours before the army force blamed for the massacre entered the city or even surrounded it. Considering the similarities in the families targeted, the cruel manner, and the timing and proximity, it's probable that the same people who conducted that operation repeated it, as reported, in the local rebel hotbed of Ras al-Nabi'. This page was last edited on 7 September 2017, at 05:35.